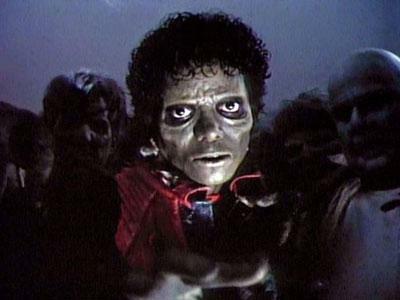 Jackson, in his iconic Thriller role. News of Michael Jackson's death caused a massive surge in internet traffic last night, temporarily crashing Google and driving huge amounts of traffic to popular sites such as Twitter and BBC News. The Press Association reports that so many people headed to Google to verify early reports of Jackson's death that Google's News servers interpreted searches for "Michael Jackson" as an automated attack for about 30 minutes. The BBC News website reported that UK traffic was 48 percent higher than usual at 4am on Friday, while Twitter traffic also surged. Ethan Zuckerman, a fellow at the Berkman Center for Internet and Society at Harvard, said that Jackson quickly became the most popular topic on the micro-blogging site as soon as he was rushed to hospital yesterday. "My twitter search script sees roughly 15% of all posts on Twitter mentioning Michael Jackson," wrote Mr. Zuckerman on his Twitter page. "Never saw Iran or swine flu reach over 5%." However, at one stage Twitter also failed to cope with the surge in traffic, according to reports. Five of the top ten trending topics on Twitter were related to the pop king at 9am on Friday morning. Thousands of people switched to Twitter from AIM after AOL's instant messaging service failed to cope with a surge in traffic, according to PC World magazine US. Users from the UK, US, and Australia all reported problems. During the 40 minutes of AIM blackout, more than 4,000 people turned to Twitter to find out what was happening with AOL's service, only to find out that Michael Jackson was hospitalised. Then came reports that the 50-year old singer is dead. Jackson collapsed at his Los Angeles mansion and was rushed to hospital by paramedics before being pronounced dead at 2:26 pm (2126 GMT). Celebrity gossip site TMZ has been credited with breaking the news after a tip-off that a paramedic had visited the singer's home.